Why not embroider boxes? This is a good question! And it also happens to be the title of a book on embroidered boxes. When I started contemplating making an embroidered box, I knew I’d have to do some research first, and then I’d have to figure out techniques. Little did I know that two books existed that are particular suitable to the topic. 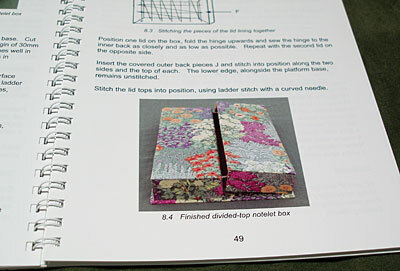 The first I’ve already reviewed – Making Hand-Sewn Boxes, by Jackie Woolsey. This second book is called Why not Embroider Boxes? by Daphne Ashby and Jackie Woolsey. Why not Embroider Boxes? was somewhat hard to find here in the States, but it is available through used book sources online, so I tracked a copy down. 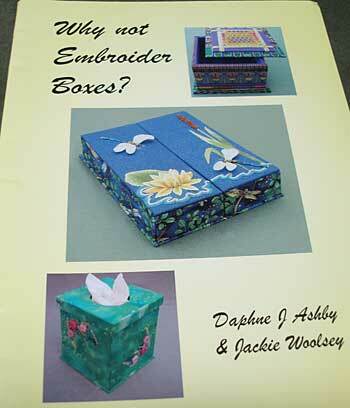 The book is the collaborative effort of embroiderer Daphne Ashby and box-maker Jackie Woolsey. 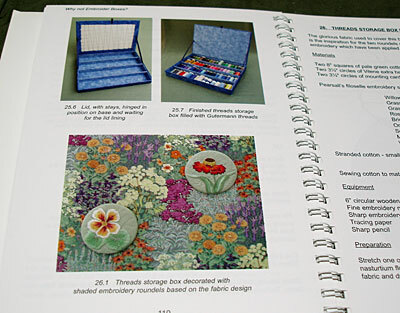 I heard from Jackie after reviewing her book Making Hand-Sewn Boxes, and she told me about this book which she thought would be more tailored towards fulfilling my quest for embroidered-box instructions. She was right! It’s a great a little book, and perfect for the ideas that are gurgling about in my head. The book is small – 6″ x 8″ – but packed with good content, including instruction not just in box assembly but also in embellishment. And hey, look! It’s spiral bound! I love instructional books that are spiral bound. 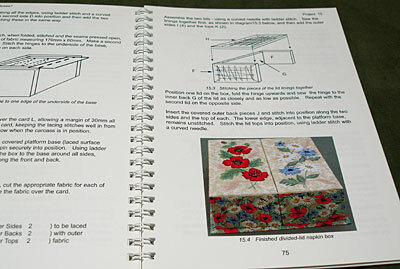 The book begins with instruction on basic box making. 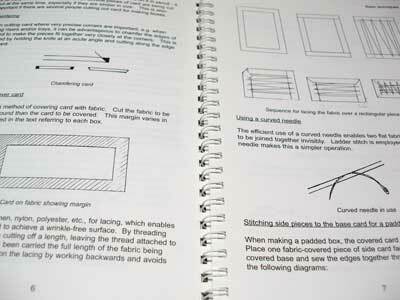 If you happen to have Making Hand-Sewn Boxes, this section is a bit repetitive, but it’s still essential for the book, and it’s always good to re-read initial instructions before launching into projects, anyway! Keep in mind, though, that the projects and the types of boxes within this book are not the same as those featured in Making Hand-Sewn Boxes. Each box in Why not Embroider Boxes? is different from those already covered in the previous book. 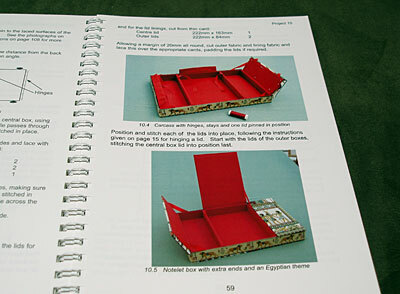 For each project in the book, we’re given instructions on making the particular type of box, and then instructions on making embroidered embellishment for the box. The embroidery design is given in the book, as well as instruction on the completion of the embroidery. Some of the embroidery is perfectly suited to beginners, while some of it is directed more for those seeking a challenging project. 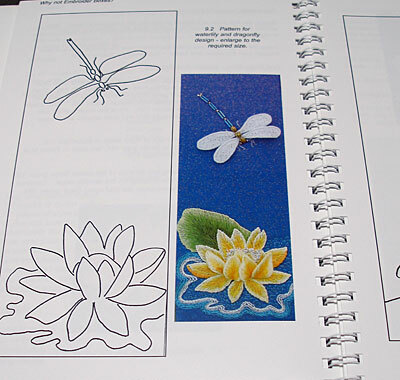 This stumpwork lily pad and dragonfly design is gorgeous and would be terrific for anyone who is keen on stumpwork. Notice the coordination between the fabric on the box and the design on the embroidery. Most of the box projects in the book are created this way – the fabric is chosen first, and then coordinating embroidery motifs are designed for the embellishment of the box. I love the variety of the boxes in the book. Details are given on how to make stays (that keep the hinged lids from flopping all the way open), dividers and hinges, all necessary components of this more complex box, which would be ideal for stationary and writing supplies. Note the coordination between the two flower motifs and the fabric on the box carcass. For many projects, the embellishment is something added separate from the actual covering of the box. In this case above, two little medallions are embroidered to match the fabric covering the lid and the rest of the box; then the medallions are sewn onto the lid fabric. While I’m more inclined to want the whole cover embroidered (or the whole box, for that matter! ), I do like this treatment a lot. I love the way the little medallions pick up the fabric. Honey, anyone? 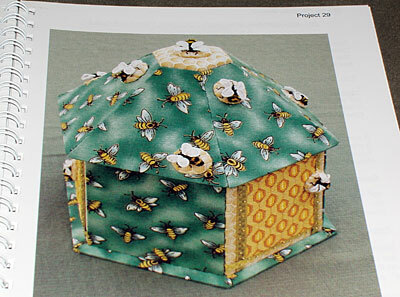 The bee box features honeycombed panels on the sides (canvas work) and stumpwork bees populating the surface of the box. I like the hexagon shape of the whole piece. And I just had to let you know that there’s a rooster in the book. I can’t get away from them! 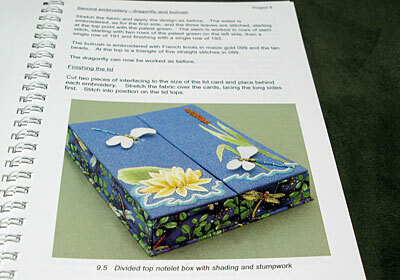 If you’re considering making an embroidered box, this is probably a book that you’ll want to have on hand! Look it up through used book sources to see if you can grab a copy! You’ll be glad you did! So are there French Knots on the rooster? I am so glad that you have featured Jackie and Daphne. They are delightful women and superb teachers of needlework. My guild had the pleasure of their instruction some years ago as touring teachers and were captivated by them. Love you web-site. Have shared it with my guild members. Have you tried a French knot picture? I bought 'Making Hand Sewn Boxes' after I read your review of it a few weeks ago. I love it and love the idea of making a box and covering it with something I have embroidered. So this very weekend, I searched online and found a book called 'Hand Stitched Boxes' by Meg Evans for $1.55! Don't know if it will be as detailed as 'Why Not Embroider Boxes,' but I am looking forward to reading it and getting some ideas. I am really tempted to get 'Why Not…" as well. PS I bet you will notice every rooster you see from now on. I know I will! Surely there must be a nicer name for such splendid articles than 'boxes'. Thanks for introducing this special book. I just ordered and received the book in this post – it looks fantastic. The instructions are complete, as far as I can tell, and their approach clearly makes it possible for you to do your own thing. Thanks! Wonderful book! Re- that rooster. No. that is made by someone who only knows chickens. 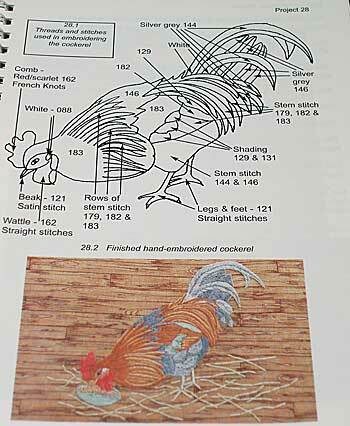 Roosters are gorgeous, spectacular, extravagant- like the one you are trying to embroider. Big and Bold. The one in the book is a poor excuse. Do any example in that book, but Not the “rooster”.. Previous Previous post: Crewel Embroidery Rooster: More Knots and Not Finished!